Last year I ran sessions to help our local cub pack to earn their Digital Maker stage 1 badges. I recently met a Scout leader who mentioned that it would be useful if I shared the experience. 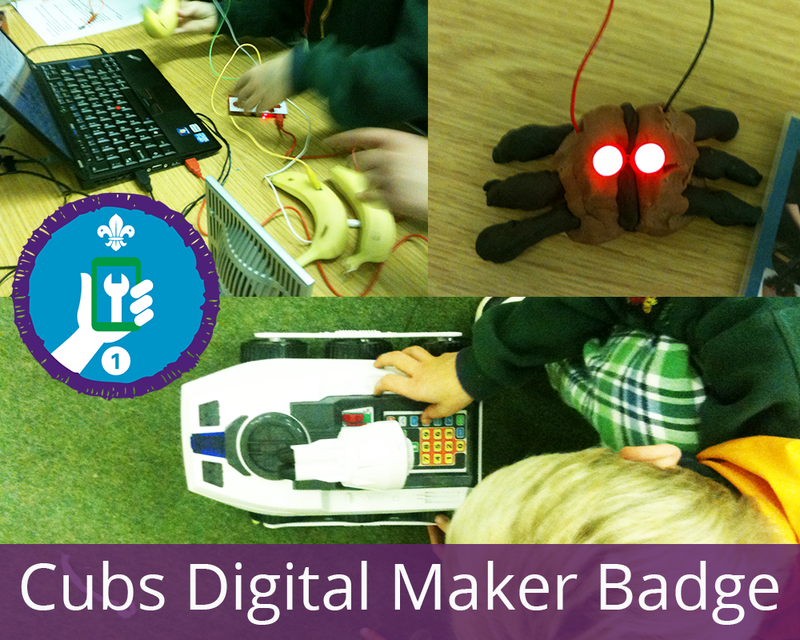 I was really pleased to see that cubs has a Digital Maker badge and that it's tied to their Digital Manifesto. The overall approach is fantastic and aims to develop cubs into creative and responsible technology users. The badges are new so we were doing stage 1 with Cubs as they hadn't done it at Beavers and children would have varying prior knowledge. Hopefully I'll get the chance to help the Cubs achieve further stages in future. Cubs is a very different environment to school so I wanted to make sure we fitted with that. There are some suggested activities but we thought we could make the activities more interesting, especially given the ratio of adults available at cubs. We ran the Digital Makers badge over two weeks. Each cub participated in 4 hands-on activities: MaKey MaKey Banana Piano, Conductive Playdough Creatures, BigTrak Challenges and Erase all Kittens. They also learned about 3D printing. We got some techie parents along to help the activities run smoothly. What is Digital Making? Brief introduction. 3D printing demo from So Make It, the local maker space. Split cubs into 4 groups. Each group did one activity. Same groups. Each group rotates through the remaining three activities. 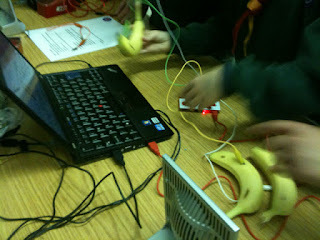 Impromptu group activity: How many children can hold hands in a MaKey MaKey circuit and still have the banana piano work? Brief recap and all cubs got a small 3D printed item to take away. We also stopped the whole pack a few times for a bit of 'show and tell' so everyone got to see cool conductive creatures and hear tunes on the banana piano. The groups had around 6 children in. In the Conductive Playdough activity the children got to work individually, in the other activities they were in groups of around 3 so there was some teamwork involved. The MaKey MaKey Banana Piano is a digital maker classic. There wasn't time to have the kids write the code for it and get to play with it so I decided to provide them with the code and have them focus on building the piano, understanding how it works, and trying it out. We had two laptops set up in advance and running offline Scratch. I had copies of the banana piano code so that it didn't matter if a group made changes to the code. It turned out that we had a pianist in the pack and he was able to play a very recognisable Ode to Joy on the banana piano his team built! Tip: Make sure you have speakers so that the cubs can hear the piano over the noise of the other activities! 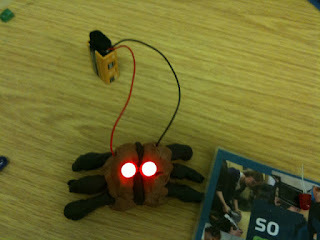 Conductive playdough is brilliant! This activity really emphasises the 'maker' aspect of digital making by mixing technology and craft. Kids get to learn the basics of electricity, investigate a conductive material and an insulator and get introduced to series and parallel circuits. This activity does require close supervision and instruction following. I prefer to have the cubs wear safety glasses because it's good practice when working with electronics. Conductive playdough is safe when used correctly. The cubs got really creative with this activity while learning a lot. It's not easy to create a creature with two light up eyes, you really have to understand how circuits work. 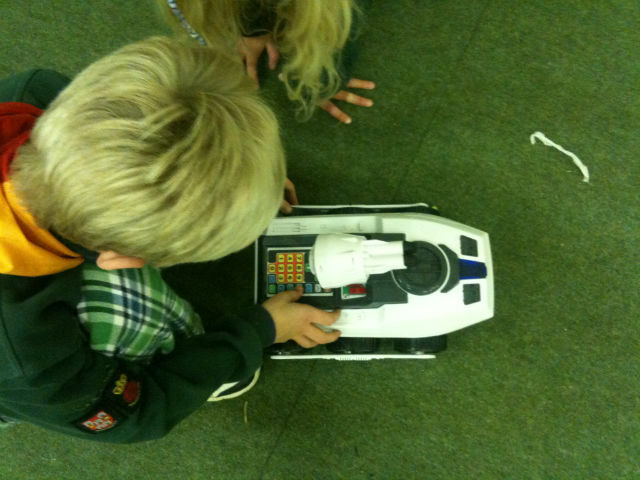 BigTrak is a retro programmable robot. Some cub leaders may remember the original from the 80s but it was brought back out a few years ago and they are fairly easy to get hold of. It's self-contained. You don't need a tablet or laptop to program it. Children are fairly unlikely to have used it at school. The children learned how to program BigTrak and then had to complete a challenge. We had laminated targets to hit with the rocket launchers, but if you don't have those then weaving in and out of cones or bleeping at a target would work too. We had one activity that required laptops and internet access. The children learned about HTML through the Erase all Kittens game. It's a short and fun introduction the language that web pages are written in. We used a wifi hotspot on a leader's phone for this activity. We had trouble getting one of the laptops that had been brought along to load the site initially, but it was fine once up and running. I thought this activity might be a little dry compared with the tech involved in the others but the cubs really enjoyed it. I also laminated some HTML and CSS examples so we could also have a discussion about how web pages worked. The ratio of one adult to six cubs for activities is such a luxury when you're used to teaching big classes. This meant that we could do really hands-on activities with the cubs and make sure they learned a lot in a short time. Having activities prepared and briefing sheets for the adult helpers made sure we made the most of the time. The badges go all the way up to level 5 so there's plenty of scope for more digital maker activities in future.